Dr. Ashley Watson completed her Bachelors of Science in Biology at Indiana University Bloomington with minors in both Chemistry and Spanish. She received her Doctor of Dental Medicine degree from Midwestern University Downer’s Grove and continued to complete a General Practice Residency at Advocate Illinois Masonic Hospital in Chicago. 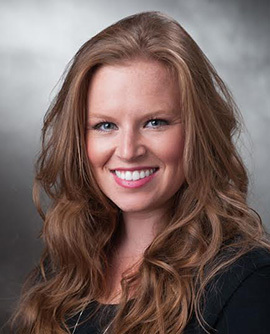 During her residency, Dr. Watson received extra training in all aspects of dentistry, including oral surgery, implant dentistry (placing and restoring), IV sedation, pediatrics, special needs patients, endodontics, restorative dentistry and more! Dr. Watson is a member of the Academy of General dentistry (AGD), American Dental Association (ADA), Illinois State Dental Society (ISDS), Chicago Dental Society (CDS)- north suburban branch, and American Academy of Implant Dentistry (AAID). She values continuing education in all areas of dentistry and remains an active member in all affiliations. Dr. Watson was raised in the northern Chicago suburbs and now lives in downtown Chicago. When not treating patients, she enjoys spending time with her family and friends, traveling, practicing yoga and enjoys the outdoors!